Panhellenic day against in-school violence ον Friday, March 6, 2015, and Tunnel investigation shocked . Another student from Dairy School from Ioannina, dared and revealed to Angeliki Nikolouli an extreme violence incident happened before about a month at the expense of the unfortunate student Vangelis Yakoumaki on the street. A week or so after the election, he was tied to a chair. He tried to escape and when he did, one of them followed him in the corridor of the hearth, passed a strap around his neck and pulled him. According to the witness, Vangelis, upset, went to his room and locked the door. Then the Cretans started Knocking at the door, threatening that if he did not open he would regret it. The 20-year-old did not get out of his room that day. Vangelis, recently, seemed overwhelmed. Characteristic of the fear he felt was that he chose to make a shower at 3 in the morning so that his compatriots would not see him . The complaints in Tunnel reached one after the other and showed a team of Cretans who were violently in charge of his death. It was a common secret at the Dairy School of Ioannina the 20-year-old Vangelis Yakoumakis, the sensitive young man, was a victim of bullying. As he revealed in the show a man , the leader of the group who was abusing him, also Cretan, had graduated and served his military service in a nearby city. 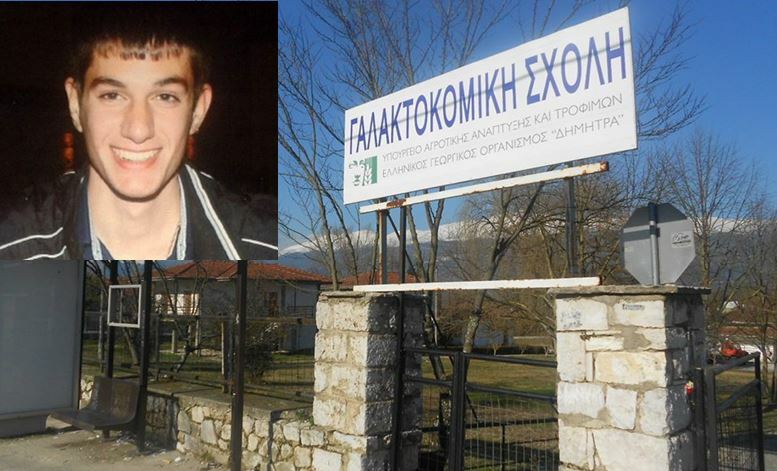 Three days before the disappearance he found himself again at the School and took the same bus for Ioannina with the missing person. Since that day Vangelis Yakoumakis has been particularly anxious. Another student of the Dairy School, who has already faced the challenges of the “tough” Cretan group, spoke to “Tunnel”. He had heard that they had hanged Vangelis out of the window with a sheet, but no one has confirmed this fact to date. He had met with Vangelis in the common showers of Hestia and had noticed intense bruises on his body. When asked what happened to him, Vangelis tried to be justified by telling him that he struck falling down the stairs. A Cretan student who had nothing to do with the attacks on Vangelis was the one who briefed his other fellow students about what was happening behind closed doors. This transported to Tunnel another important witness who broke his silence. In the beginning they spoke to Vangelis, motivating him to join with them, and not with his ferocious compatriots. As they saw that this situation continued, and Vangelis’ psychology deteriorated, they decided to act. First they informed the Head of the School. “The Director invited Vangelis to his office and the other Cretans,” the witness told Tunnel. And this witness described the general offending behavior of the group of hard Cretans who was widely known to the staff of the School even to representatives of the Greek Agricultural Organization. He referred to specific incidents that occurred at the School in the spring of 2014. At that time, the Cretans had created big feuds, caused serious material damage to the premises of Hestia and brutally beat Vangelis. According to the witness’s opinion, if the students’ parents had been warned then, the worst may have been avoided. A few days before the disappearance of the 20-year-old, the former head of the “hard” team, who served his military service near Ioannina, visited the director. He asked him to get his diploma, but the Director refused to give it if he did not fill the material damage he had caused to the School. As the witness claimed, the presence of this person in the School caused a tremor in Vangelis.